The man suspected of shooting dead 13 people in Serbia before turning the gun on himself has died, according to hospital officials. 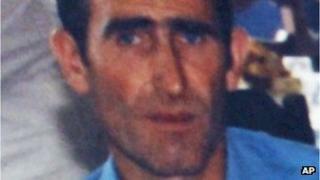 Police say Ljubisa Bogdanovic, a 60-year-old war veteran, murdered six men, six women and a two-year-old boy in a village near Belgrade. He had been in a serious condition in hospital after trying to kill himself and his wife in the rampage on 9 April. Bogdanovic fought with the Serb forces in the war in Croatia in 1991. The shootings took place in several houses in Velika Ivanca, about 50km (30 miles) south-east of the capital Belgrade, at about 0500 local time (0300 GMT) on Tuesday. Local residents said the gunman, armed with a 9mm handgun, went door-to-door shooting dead neighbours, some of whom were still asleep. The victims are also believed to include his mother and son. They are expected to be buried on Friday. Bogdanovic's wife, Javorka, is reportedly in a stable condition in hospital. The suspect is said to have been made redundant last year. The motive for the murders remains unclear.